Originally recorded at Unite Boston 2015, the Tanks tutorial series will teach you how to create a 2 player (one keyboard) shooter game. You’ll learn about simple game mechanics, integrating world and screen space UI, as well as game architecture and audio mixing. Based on this tutorial, we demonstrate in these additional videos how to use GameRules to create this game. For each phase, you will have to follow the official training from Unity. For each script creation, follow the corresponding video below. Phase 1 teaches you how to set up the base scene using the provided assets. Once you have followed the Phase 1 Scene Setup tutorial, you can setup GameRules workspace and application. Hi Everybody, welcome to this tutorial serie. We will demonstrate how to effectively use GameRules extension inside Unity and how it facilitates and speeds up Developers and Designers work. Al these videos needs to be followed at same time than videos available at Unity website as we only demonstrate here the creation of the rules to generate needed scripts. So each time Tanks tutorial asks you to create a script, then you have to switch instead to GameRules and follow this tutorial instead. First of all, once you have installed GameRules from the asset store, you need to create your workspace. In the window menu, click on GameRules Studio. GameRules Studio is the console to create rules and build your script through the rule assembly. As there is no workspace yet, GameRules studio shows first this Application wizard. The application name has by default the name of the game from player settings. Here you will change this to Tanks. And then click on Create Application. This creation takes some time as it imports the Core package of rules which contains hundreds of rules to be reused in your game. Choosing a correct application name is critical as it creates automatically a ruleset and root class based on this name. The Tanks class inherits from Core class. As you can see a GameRulesWorkspace folder has been created. If you refresh it, this Editor folder contains a file named gamerules.sqlite which is actually the embedded database containing all rules. Never delete this file otherwise you loose all your work. Well now this first tutorial is finished. Thank you for your attention. Phase 2 teaches you how to add the tank artwork and components to let the player control the tank. You have to follow the Phase 2 Tank Creation & Control tutorial, until the TankMovement script creation at duration 20min35. After that you can switch to the tutorial below to create it inside GameRules. When watching video tutorial from Unity for this phase 2, stops at 20min45sec and do NOT attach the TankMovement script to the tank. You can optionally continue to watch the video till 22min35 to understand what you try to achieve with the and compare how rules can achieve easily what you are used to develop in Mono or Visual Studio. 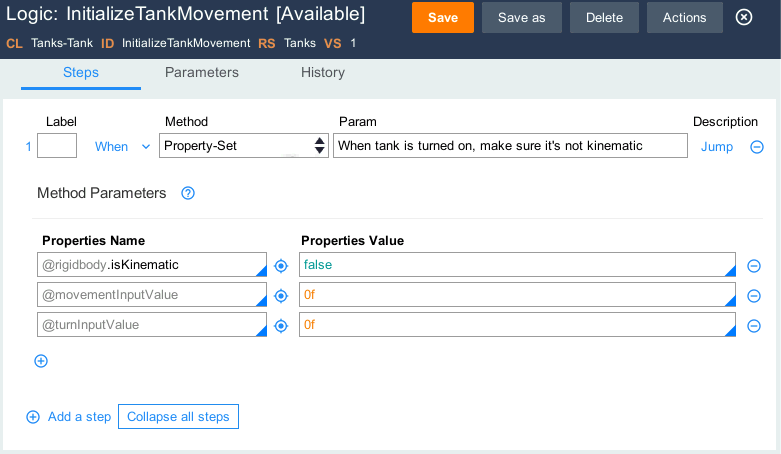 Instead, you will create a TankMovement flow rule and all other related rules in GameRules and then will assemble it before attaching it to the Tank prefab. class Tanks-Tank: this class contains all rules related to tank game object. This class has the same inheritance than Tanks. Property playerNumber created under Tanks class of class int, with default value 1 and description “indicates which player number this game object is”. This property is created there as it will probably be reused by other rules not related to Tank game object. other properties are very specific to tank, so they are create under Tank class. speed is a property which already exists in Core class. but as the default value is different, you can save as it under Tank class and change the default value to 12f, so the rule resolution mechanism will take this copy instead of the property from Core during rule assembly. Property rigidbody already exists in Core class with correct initialization. So you don’t need to change it. Property movementAxisName in class Tank of class string with initialization “Vertical” + @playerNumber in message Start. By this way, the rule assembly will automatically bring playerNumber definition in the generated script. Property turnAxisName in class Tank of class string with initialization “Horizontal” + @playerNumber in message Start. 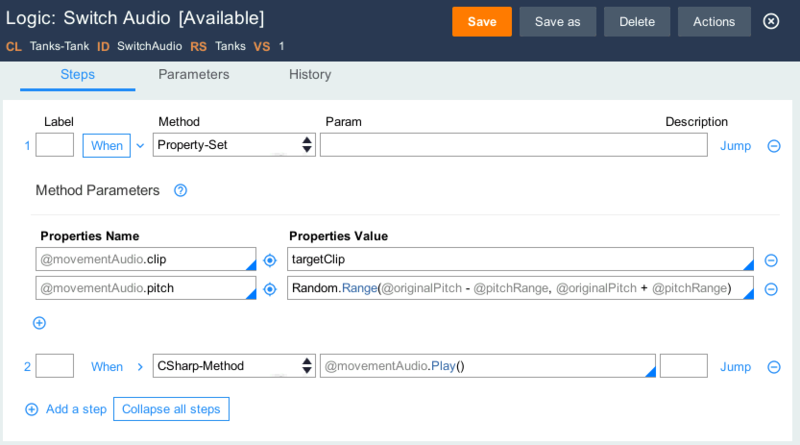 Property originalPitch in class Tank of class float with initialization @movementAudio.pitch in message Start. By this way, the rule assembly will automatically bring movementAudio definition in the generated script. Property movementInputValue in class Tank of class float with initialization Input.GetAxis(@movementAxisName) in message Update. One again, the rule assembly mechanism will recursively brings definition and assemble also movementAxisName and playerNumber. You can check in View C# action menu the expected result if a Flow is using this property. Property turnInputValue in class Tank of class float with initialization Input.GetAxis(@turnAxisName) in message Update. One again, the rule assembly mechanism will recursively brings definition and assemble also turnAxisName and playerNumber. You can check in View C# action menu the expected result if a Flow is using this property. 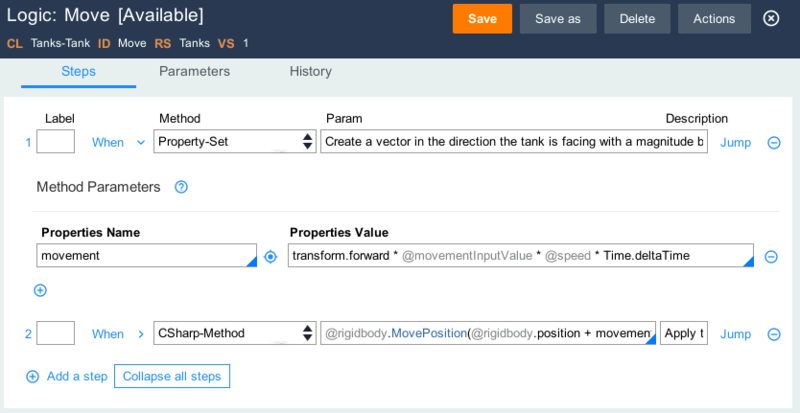 Flow TankMovement under Tank class with description “Tank movement”. Create a new logic state and connect it to the OnEnable state. The logic state call a logic rule named InitializeTankMovement. Create on open icon to create this logic rule. Create a new start state with message Update. Create a new logic state and connect it to the Update state. 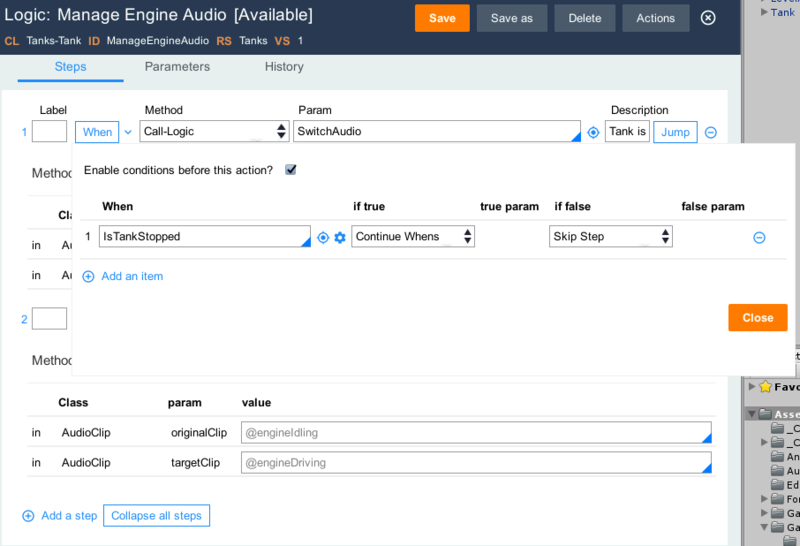 The logic state call a logic rule named ManageEngineAudio. Create on open icon to create this logic rule. Jump condition true with if true end logic (to prevent step 2 from executing). When condition @movementAudio.clip == originalClip, if true continue whens, if false end logic. Create a new logic state and connect it to the FixedUpdate state. The logic state call a logic rule named Move. Create on open icon to create this logic rule. Create a new logic state and connect it to the Move state. The logic state call a logic rule named Turn. Create on open icon to create this logic rule. step 1 Property-Set description “Make this into a rotation in the y axis”. Save everything. 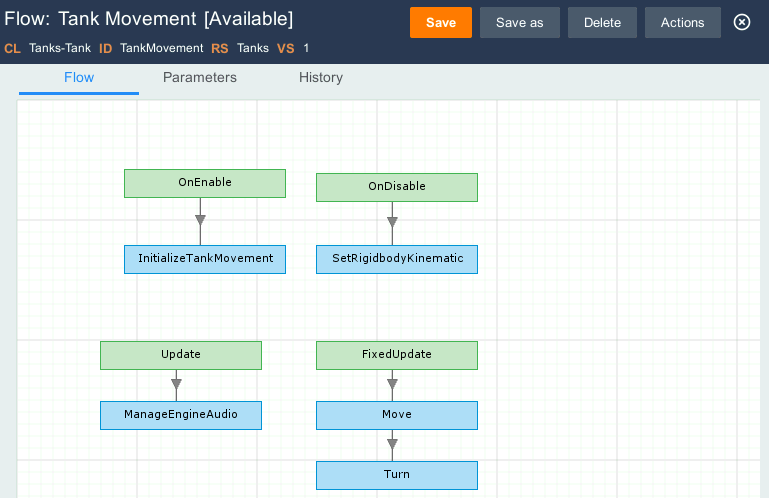 For the flow TankMovement, click on View C# action to have a preview of the generated C#. You will see how the rule assembly mechanism automatically brings properties and other rules as soon as they are used in the final script. All the rules created are reusable and easier to maintain as they all represent a small piece of functionality. Click on Build Product on the top bar. The flow TankMovement has been automatically added to the current product rule upon creation. The build product button runs the rule assembly process. The generated script can be found under GameRulesWorkspace/scripts/Tanks/Tank/TankMovement_Tanks_Tank_RuleObjectFlow.cs. Drag and drop it to the Tank game object in inspector and fill in public variables as described in tutorial video from Unity starting 58min15sec. Then click on Play to test if the tank is moving correctly. You have to follow the Phase 3 Camera Control tutorial, until the Camera script creation at duration 8min18. When watching video tutorial from Unity for this phase 3, stops at 8min18sec and do NOT attach the CameraControl script to the camera rig. Instead, you will create a CameraControl flow rule and all other related rules in GameRules and then will assemble it before attaching it to the CameraRig game object. class Tanks-Camera: this class contains all rules related to camera rig game object. This class has the same inheritance than Tanks. Property dampTime created under Camera class of class float, with default value 0.2f and description “Approximate time for the camera to refocus”. Property screenEdgeBuffer created under Camera class of class float, with default value 4f and description “Space between the top/bottom most target and the screen edge”. Property minSize created under Camera class of class float, with default value 6.5f and description “The smallest orthographic size the camera can be”. Property targets created under Camera class of class Transform and description “All the targets the camera needs to encompass”. camera is a property which already exists in Core class. but as the default value is different, you can save as it under Camera class and change the initialization code to GetComponentInChildren<Camera>(), so the rule resolution mechanism will take this copy instead of the property from Core during rule assembly. Flow CameraControl under Camera class with description “Camera control”. 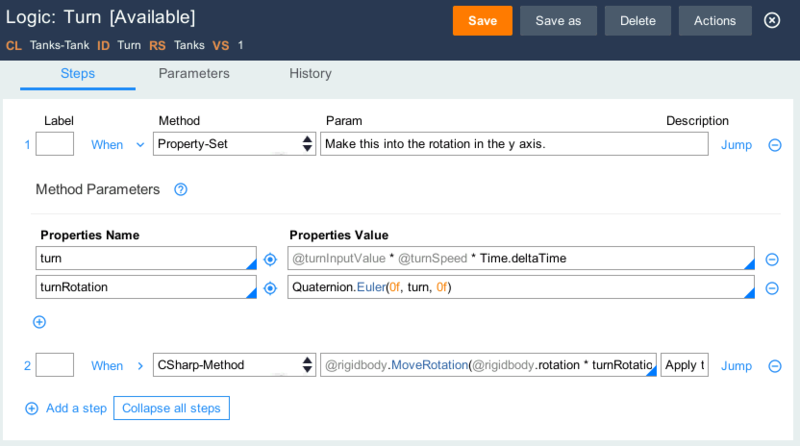 step Property-Set with description “Find the position the camera rig is moving towards in its local space”. Add logic rule FindRequiredSizeByTarget to the additional logic rules list in parameters tab to make sure this logic rule will be part of the rule assembly. Create a new logic state and connect it to the Move logic state. The logic state call a logic rule named Zoom. Create on open icon to create this logic rule. Create a new logic state and connect it to the SetStartPositionAndSize start state. The logic state call a logic rule named SetStartPositionAndSize. Create on open icon to create this logic rule. Click on Build Product on the top bar. The flow CameraControl has been automatically added to the current product rule upon creation. The build product button runs the rule assembly process. The generated script can be found under GameRulesWorkspace/scripts/Tanks/Camera/CameraControl_Tanks_Camera_RuleObjectFlow.cs. Drag and drop it to the CameraRig game object in inspector and fill in public variable targets with Tank game object.Then start to play to test the camera control. You have to follow the Phase 4 Tank Health tutorial, until the UIDirectionControl script creation at duration 21min27. When watching video tutorial from Unity for this phase 4, stops at 21min27sec and do NOT attach the UIDirectionControl script to the HealthSlider. class Tanks-UI: this class contains all rules related to UI. This class inherits from Core-UI (instead of Core like Tanks). Property useRelativeRotation created under UI class of class bool, with default value true. Property relativeRotation created under UI class of class Quaternion, type Private, with default value transform.parent.localRotation in message Start. Flow UIDirectionControl under UI class. Create a new logic state and connect it to the Update state. The logic state call a logic rule named SetUIDirectionControl. Create on open icon to create this logic rule. Build the product and then attach the generated script UIDirectionControl_Tanks_UI_RuleObjFlow.cs to HealthSlider object. Now you can come back to the video at 23min00 and follow instructions till 26min10. Property startingHealth created under Tank class of class float, with default value 100f and description “The amount of health each tank starts with”. Property slider created under Tank class of class Slider with description “The slider to represent how much health the tank currently has”. Property fillImage created under Tank class of class Image, with description ” The image component of the slider”. Property fullHealthColor created under Tank class of class Color with default value Color.green and description “The color the health bar will be when on full health”. Property zeroHealthColor created under Tank class of class Color with default value Color.red and description “The color the health bar will be when on no health”. Property explosionPrefab created under Tank class of class GameObject with description “A prefab that will be instantiated in Awake, then used whenever the tank dies”. Property currentHealth created under Tank class of class float, with default value @startingHealth in message OnEnable and description “How much health the tank currently has”. Property dead created under Tank class of class bool with default value false in message OnEnable and description “Has the tank been reduced beyond zero health yet?”. Property explosionParticles created under Tank class of class ParticleSystem with default value Instantiate (@explosionPrefab).GetComponent<ParticleSystem> () in message Awake and description “The particle system the will play when the tank is destroyed”. Property explosionAudio created under Tank class of class AudioSource with default value @explosionParticles.GetComponent<AudioSource> () in message Awake and description “The audio source to play when the tank explodes”. As you can see under View C#, there is a cascading initialization when referencing explosionParticles property. Flow TankHealth under Tank class. Create a new logic state and connect it to the OnEnable state. The logic state call a logic rule named SetHealthUI. Create on open icon to create this logic rule. Create a Message rule TakeDamage of type Public function, returning void, with input parameter float amount. Property-Set with description “Move the instantiated explosion prefab to the tank’s position and turn it on”. CSharp-Method: @explosionParticles.Play() with description “Play the particle system of the tank exploding”. CSharp-Method: @explosionAudio.Play() with description “Play the tank explosion sound effect”. Create a new logic state and connect it to the TakeDamage state. The logic state call a logic rule named SetDamage. Create a new logic state and connect it to the SetDamage state. The logic state call a logic rule named SetHealthUI. Create a new logic state and connect it to the decision state. The logic state call a logic rule named OnDeath. Click on the transition between the decision state and the OnDeath logic and setup When condition using rule IsDead and 10%. Then build the product and attach the generated script TankHealth_Tanks_Tank_RuleObjectFlow.cs to Tank game object. Fill in public variables as described in the video, save the scene and play. You have to follow the Phase 5 Shell Creation tutorial, until the ShellExplosion script creation at duration 8min30. When watching video tutorial from Unity for this phase 5, stops at 8min30sec and do NOT attach the ShellExplosion script to the Shell game object. class Tanks-Shell: this class contains all rules related to Shell. Property tankMask created under Tanks class of class LayerMask. Save as the property Tanks-Tank.explosionParticles to Tanks.explosionParticles and make it Public with no initialization. Save as the property Tanks-Tank.explosionAudio to Tanks.explosionAudio without modification. Delete old property in Tanks-Tank. Property maxDamage created under Shell class of class float with default value 100f and description “The amount of damage done if the explosion is centred on a tank”. Property explosionForce created under Shell class of class float with default value 1000f and description “The amount of force added to a tank at the centre of the explosion”. Property maxLifeTime created under Shell class of class float with value 2f and description “The time in seconds before the shell is removed”. Property explosionRadius created under Shell class of class float with value 5f and description “The maximum distance away from the explosion tanks can be and are still affected”. Flow ShellExplosion under Shell class. Create a new logic state and connect it to the OnTriggerEnter state. The logic state call a logic rule named ExplodeShell. Add logic rule DamageTank in additional logic rules under parameters tab. CSharp-Method : @explosionParticles.Play() and description “Play the particle system”. CSharp-Method : @explosionAudio.Play() and description “Play the explosion sound effect”. Call-Logic rule named DestroyGameObject and description “Destroy the shell”. Once done, save them all, build the product, and attach the generated script ShellExplosion_Tanks_Shell_RuleObjectFlow.cs to Shell game object. Specify public variables with missing particle system. Play the game. You have to follow the Phase 6 Firing Shells tutorial, until the TankShooting script creation at duration 13min20. When watching video tutorial from Unity for this phase 6, stops at 13min20sec and do NOT attach the TankShooting script to the Tank game object. Instead, you will create a TankShooting state machine rule and all other related rules in GameRules and then will assemble it before attaching it to the Tank game object. This tutorial will introduce State Machine rule. The generated code TankShooting will look very different from the script proposed by Unity. You will reuse Tank class created during Phase 02. Property shell created under Tank class of class Rigidbody with description “Prefab of the shell”. Property fireTransform created under Tank class of class Transform with description “A child of the tank where the shells are spawned”. Property aimSlider created under Tank class of class Slider with description “A child of the tank that displays the current launch force”. Property shootingAudio created under Tank class of class AudioSource with description “Reference to the audio source used to play the shooting audio. NB: different to the movement audio”. Property chargingClip created under Tank class of class AudioClip. Property firingClip created under Tank class of class AudioClip. Property minLaunchForce created under Tank class of class float and default value 15f. 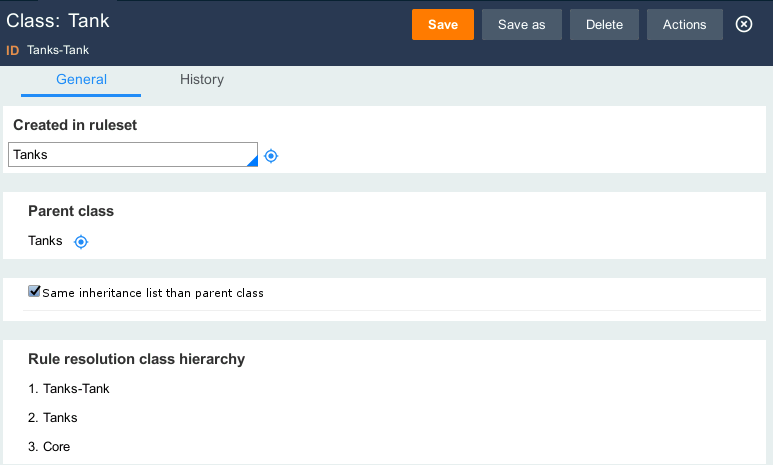 Property maxLaunchForce created under Tank class of class float and default value 30f. Property maxChargeTime created under Tank class of class float and default value 0.75f. Property FireButton created under Tanks class of class string with default value “Fire” + @playerNumber in Start message with private visibility. Property currentLaunchForce created under Tank class of class float with private visibility. Property chargeSpeed created under Tank class of class float with private visibility and default value (@maxLaunchForce - @minLaunchForce) / @maxChargeTime in message Start. State Machine TankShooting under Tank class. In parameter tab, set default state = Idle, in message OnEnable. Logic = leave it blank, there is no particular action to perform there. Logic = leave it blank. For Firing state, when entering state, call FireShell. Now, you can save and build the product. Once assembled, attach the script TankShooting_Tanks_Tank_RuleObjectStateMachine to the Tank game object. 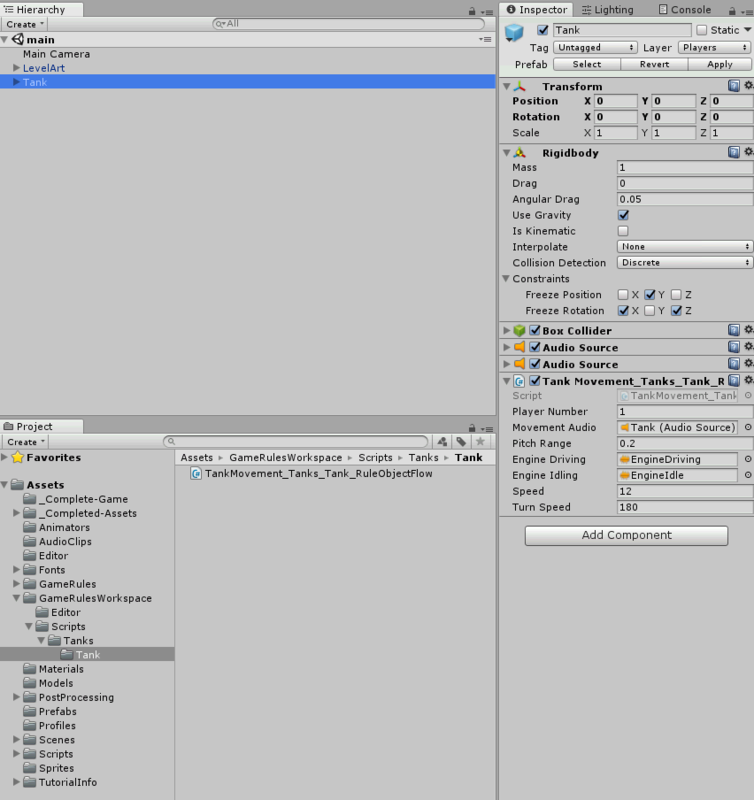 Fill in different public variables as indicated at the end of the Unity Phase 06 tutorial and play the game. You have to follow the Phase 7 Game Managers tutorial, until the GameManagers script creation at duration 12min50. When watching video tutorial from Unity for this phase 7, stops at 12min50sec with the empty GameManager game object. class Tanks-Managers: this class contains all rules related to managers. Property TankPrefab created under Managers class of class GameObject. Property spawnPoint already exists in Core class, so we don’t need to recreate it. Property TankInstance created under Managers class of class GameObject with Public & Hide in inspector option. Property playerColor created under Managers class of class Color. Property coloredPlayerText created under Managers class of class string with Public & Hide in inspector option. Property canvasGameObject created under Managers class of class GameObject with Private option. Property wins created under Managers class of class int with value 0 and with Public & Hide in inspector option. in parameters tab, blank Extension value and check Is Class Serializable. Create the Setup message as a public function returning void and with parameter int playerNumber. Create the EnableControl message as a public function returning void. Create the DisableControl message as a public function returning void. Create the Reset message as a public function returning void. 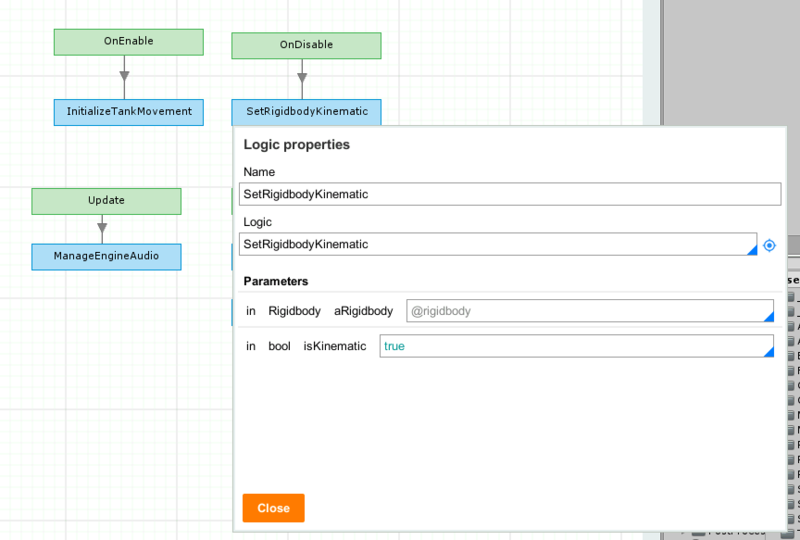 In flow TankManager, create a new logic state and connect it to the Reset state. The logic state call a logic rule named Reset. Create the WinRound message as a public function returning void. In flow TankManager, create a new logic state and connect it to the WinRound state. The logic state call a logic rule named IncreaseWins. Now that Tank Manager is finished. Build the product so the TankManager class is generated and can be reused as property class to interact with. Once product build is done, let’s create GameManager flow. Property TankManagers created under Managers class of class TankManager_Tanks_Managers_RuleObjectFlow. Property tankRoundWinner created under Managers class of class TankManager_Tanks_Managers_RuleObjectFlow with Private option. Property tankGameWinner created under Managers class of class TankManager_Tanks_Managers_RuleObjectFlow with Private option. Property messageText created under Managers class of class Text. Property numRoundsToWin created under Managers class of class int with default value 5. Property roundNumber created under Managers class of class int with Private option and default value 0. Property numTankLeft created under Managers class of class int with value 0 and with Private option. Property startDelay created under Managers class of class float and default value 3f. Property startWait created under Managers class of class WaitForSeconds with value new WaitForSeconds (@startDelay) in message Start and with Private option. Property endDelay created under Managers class of class float and default value 3f. Property endWait created under Managers class of class WaitForSeconds with value new WaitForSeconds (@endDelay) in message Start and with Private option. Property cameraControl created under Managers class of class GameObject. Create a new logic state and connect it to the Start state. The logic state call a logic rule named SpawnAllTanks. Create a new logic state and connect it to the SpawnAllTanks state. The logic state call a logic rule named SetCameraTargets. Create a new logic state and connect it to the SetCameraTargets state. The logic state call a logic rule named GameLoop. In parameters tab, change logic type to Coroutine. Automatically, the flow GameManager will adapt the call to GameLoop by doing a StartCoroutine. In parameters tab, change logic type to Coroutine. Once done, click play to enjoy the game.